Working within your comfort level, color can brighten and enhance the flavor of your home. Working within your comfort level, color can brighten and enhance the flavor of your home. A pop of red here, a sprinkle of blue there… color is no longer something to fear. St. Louis Homes & Lifestyles wants to encourage you to taste the rainbow with home accessories, furnishings and products in a variety of colors. one: Avalon turquoise box, available at Savvy Surrounding Style. two: Sapphire glass mirror, available at Savvy Surrounding Style. three: Nibbles cablekeeper in light blue, by Nice. four: Blue ceramic finial rose, available at Three French Hens. five: Teal and gold vase, available at MKS. 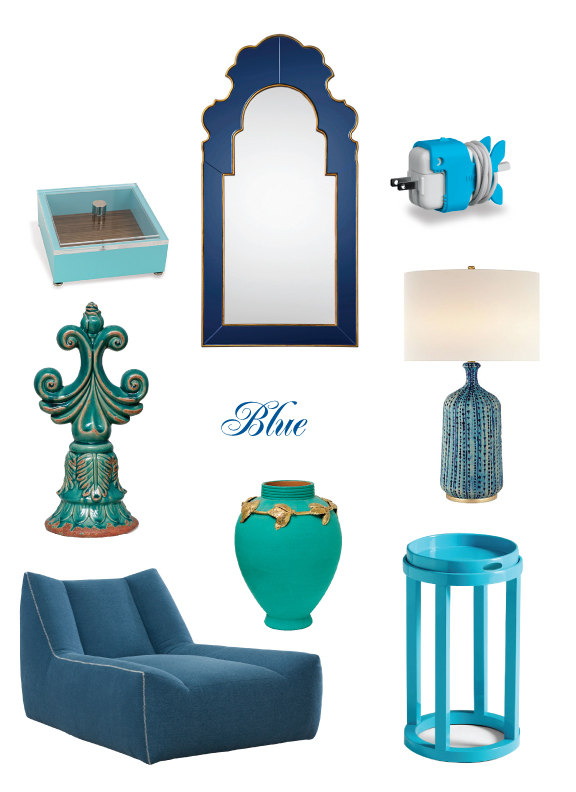 six: Culloden table lamp in pebbled aquamarine, by Aerin, available at KDR Designer Showrooms. seven: Armless chaise in tote capri, by Lee Industries, available at KDR Designer Showrooms. eight: Marcella tray table, available at Ellen Kurtz Interiors and Savvy Surrounding Style.